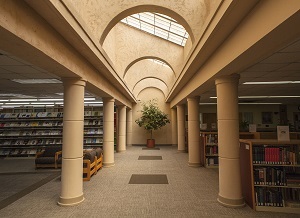 Daniel A. Cannon Memorial Library is located on the University Campus, north of Tampa, Florida. University Campus students: the library building is open for extended hours during the academic year, along with all of our online resources and services. Computers: There are two computer classrooms and one computer lab in the Daniel A. Cannon Memorial Library. Full Internet access and all necessary software for classes is available. Lab hours: the computer lab opens when the library opens, and closes 30 minutes before the rest of the library closes. In addition to the lab and classrooms, the library also has computers available for library research on the first floor in reference and on the second floor in the stacks. Laptops: Laptops are available for checkout by commuter students, faculty and staff, for up to five days, with no renewal. You must have a current university ID to checkout a laptop. Center students: you can use the library's resources and services online, and of course, feel free to ask for materials and assistance from the Daniel A. Cannon Memorial Library or from a library associated with your Center. You also have access to any library with whom we have arranged access. Online students: you have access to many of the same resources as our Center students. We are always here to help you; whether you are on campus or around the world. Circulating materials (books, reprints from print journals) are checked out for one month and can be sent to you. If you need an article from a print journal, we can fax, email, or send it to you through the U.S. mail if you live off-campus. Our Staff is dedicated to helping you achieve academic excellence, and assisting you with your library research. We are concerned about your success in finding the information you need, and are committed to providing remote and traditional library services to all patrons.